We’d love your help. Let us know what’s wrong with this preview of How to Fail at Almost Everything and Still Win Big by Scott Adams. Scott Adams has likely failed at more things than anyone you’ve ever met or anyone you’ve even heard of. So how did he go from hapless office worker and serial failure to the creator of Dilbert, one of the world’s most famous syndicated comic strips, in just a few years? 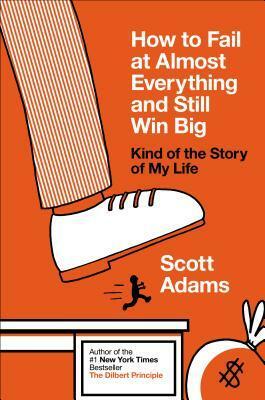 In How to Fail at Almost Everything and Still Win Big, Adams shares the strategy he has used since he w Scott Adams has likely failed at more things than anyone you’ve ever met or anyone you’ve even heard of. So how did he go from hapless office worker and serial failure to the creator of Dilbert, one of the world’s most famous syndicated comic strips, in just a few years? In How to Fail at Almost Everything and Still Win Big, Adams shares the strategy he has used since he was a teen to invite failure in, to embrace it, then pick its pocket. • "Passion" is bull. What you need is personal energy. To ask other readers questions about How to Fail at Almost Everything and Still Win Big, please sign up. First of all: amazing book! A thing I thought about was that Scott Adams didn't mention planning a single time (if I remember correctly), but wouldn't planning [which activities to pursue] increase the odds of "luck finding you" tremendously? So I wonder, was there any reason for not mentioning it? The first chapter of this book--along with the title--had me absolutely hooked. I have faced a lot of failure in my life, and it was really encouraging to hear Scott Adams, who eventually found success, talk about having a mentality of "inviting failure and then not letting it leave until you pick its pockets." But after the first couple chapters, things went rapidly down hill. The problem is that, as far his life is presented in the book, Scott Adams hasn't really known much meaningful failure *a The first chapter of this book--along with the title--had me absolutely hooked. I have faced a lot of failure in my life, and it was really encouraging to hear Scott Adams, who eventually found success, talk about having a mentality of "inviting failure and then not letting it leave until you pick its pockets." The problem is that, as far his life is presented in the book, Scott Adams hasn't really known much meaningful failure *at all*. His long list of failed enterprises (and it is long) includes mostly harmless idiocy during college (like not wearing a suit to an interview) or failed entrepreneurial endeavors that came about AFTER he was already rich and famous from Dilbert. I'm sorry, but if you're already a famous cartoonist, I really couldn't care less if your line of healthy vegetarian burritos flops. That's just not failure in any significant sense of the word. In addition to making his book hard to relate to ("Let me tell you about the time I invested tons of money in stocks and lost it all. And didn't care! 'Cause I had plenty more! "), his advice is very B-grade. You just get the feeling that he might work hard, but he hasn't really had to *struggle* in a truly painful sense. (Well, he has against a health issue, but other than providing a dramatic hook, that's not really relevant to the lessons of his book.) As a result, his understanding of a lot of life principles is pretty shallow. For example, he distinguishes between goals and systems when what he really means is outcomes and processes. This is pretty rudimentary stuff, and it just gives the impression that he's just a dilettante who's never had to develop real discipline. After all: most of his advice is about how to conserve will power by arranging your life in a way that the path of least resistance is also the most healthy / beneficial thing to do. Great! You know, IF you're already successful. And that's what this comes down to: it's a book about someone illustrating that it's very, very easy to keep being successful once you're already successful. Good for you, Scott Adams. What does that have to do with someone who is struggling to support a family and recover from major life setbacks while also chasing down their dreams? Not a damn thing, that's what. 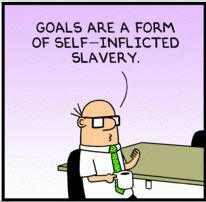 Scott Adams reminds me a lot of the guys at Penny Arcade. I really love their work (all of them), but you should just never go to get advice from someone who accidentally stumbled into riches and fame without even really having to try. They just don't know what life is like for normal people, no matter how helpful they might try to be. Scott seems like a nice guy. He shared personal elements of his life story. He was self-deprecating and not intentionally arrogant. I think he really means well. So I feel bad ragging on the book, but it's just pretty darn useless (not to mention weird, when he starts talking about affirmation and is clearly continuing a conversation I have no knowledge of with his blogging audience) as self-help and not really funny enough as humor. Preface: I randomly bought this book on my kindle when its ad popped up after I opened my kindle cover. I have a habit of impulsively buying/downloading arbitrary books onto my kindle and because thus far I've always been pleased with my stray purchases influenced by Amazon's ads, I don't object to the marketing. I didn't know who Scott Adams is. I've heard of the Dilbert comic strip but that's it; never read them. I've never read any of his works until this book. My opinion of this book? Absol Preface: I randomly bought this book on my kindle when its ad popped up after I opened my kindle cover. I have a habit of impulsively buying/downloading arbitrary books onto my kindle and because thus far I've always been pleased with my stray purchases influenced by Amazon's ads, I don't object to the marketing. I didn't know who Scott Adams is. I've heard of the Dilbert comic strip but that's it; never read them. I've never read any of his works until this book. My opinion of this book? Absolutely worth my time and mere $12. Reading the book was akin somewhat to how I think it would be like to have the good fortune of knowing a sharp, successful, resolute person who was willing to share his thoughts, over time and many coffee get-togethers, on his success and life in general. Tongue in cheek title but quite a fresh, enlightening book that actually is more aptly described as 'How to Think towards and about Success'. This is a book of opinions. That make good sense. Nothing earth shattering but rarely is anything that is simultaneously difficult and easy to do novel or original. Jim Rohn used to explain that behaviors that are conducive to the path toward success are easy to do but also easy not to do. The value in Adam's thoughts come in the form of offering his experiences and methods in his own life on making it easier to do the right behaviors, and thus making it easier for him and us to choose the successful habits. Adam's book offers his macro view of what allows for success, what greases the wheels for success. And how not to get hung up on popular concepts like "passion". Great short chapter on the fallacy behind being fed advice to "follow your passion" which Adams reasons can be detrimentally misleading. In short, readers will be better off simply reading this single chapter and understanding Adam's explanation that success is more a factor in causing passion than passion is in causing success and that energy is good but the concept of passion can be bullcrap, as Adams says. I don't mind reading opinionated thoughts because I am sufficiently confident that I can ferret out what I need and want from them without getting hung up on them. (There are some weird opinions on hypnosis and notion of humans as holograms in a computer software program that were wasted on me…but it's all good; I still like the book….) I very much liked Adam's "How to Fail at Almost Everything" precisely because he didn't strain over proving his logic or overwhelm us with justifications for his methods. He shares with us his thoughts: he shares a simplified extract of his personal thought processes and offers them as an example of how such might facilitate our own path toward our ideas of success. Adams offers patterns he's observed in his life that can prove useful and ways to think of concepts that are more practical over popular alternatives that tend to weigh us down with intricate methodical scientifically proven plans that may not be easy to sustain in the long-run. There are some core, foundational aspects in our lives that Adams lays out that need attention in order for us to find our success. Adams believes that you need to tend to the groundwork for success by tending to your mind and body so as to allow yourself and your own set of talents and strengths to surface and flourish. Success is not easy but it's achievable...for anyone. Adams provides a set of skills and areas of knowledge towards which he thinks we should all vow a lifetime commitment to honing, learning and mastering. These make up a manageable and sensible list that will help in dealing with life and other people. 1. "If you believe people use reason for the important decisions in life, you will go through life feeling confused and frustrated that others seem to have bad reasoning skills." So damn true, Mr. Adams. 2. Success/Passion fallacy of thinking. It's all comes down to your personal energy. 3. Simplify your systems, thus simplifying your life. 4. Good ideas have no value - it's all about execution, Baby. 5. Always be looking for your next better job options as soon as you get your current job. 7. Systems are ongoing; it doesn't matter if you can't tell their components are moving you towards the right direction on a daily basis. 8. Wishing is for losers. Decide to pay the price and then pay it. 9. Manage your illusions wisely and you might get what you want even if you don't understand why or how it worked. 10. Careful who you surround yourself with. 11. Everyone "is a basket case on the inside." 12. "If you do selfishness right, you automatically become a net benefit to society." I don't think anyone reads Scott Adams for serious life insights. All of us who are familiar with Dilbert knows his ferocious tongue-in-cheek humour, especially targeting the stupidities of the corporate world. So that was what I was expecting while I took up this book to while away a long flight - something on the lines of Dogbert's Top Secret Management Handbook. Making comics is a process by which you strip out the unnecessary noise from a situation until all that is left is the absurd-yet-true core. I’m not too proud to admit that given a choice between saying what’s true and saying what’s funny, I’ll take the path with the greatest entertainment value. In our messy, flawed lives, the nearest we can get to truth is consistency. Consistency is the bedrock of the scientific method. Scientists creep up on the truth by performing controlled experiments and attempting to observe consistent results. In your everyday, nonscientist life you do the same thing, but it’s not as impressive, nor as reliable. For example, if every time you eat popcorn, one hour later you fart so hard that it inflates your socks, you can reasonably assume popcorn makes you gassy. It’s not science, but it’s still an entirely useful pattern. Consistency is the best marker of truth that we have, imperfect though it may be. However, as I proceeded further, this slowly moved into self-help book territory; with Adams speaking of the need for a "system" rather than a goal; about positive energy; and all that sort of rot. Then he began to praise selfishness! I had to rub my eyes and look again. No, he was not being sarcastic but in right earnest. My God! I thought. How did Ayn Rand sneak into this? Capitalism is rotten at every level, and yet it adds up to something extraordinarily useful for society over time. The paradox of capitalism is that adding a bunch of bad-sounding ideas together creates something incredible that is far more good than bad. Capitalism inspires people to work hard, to take reasonable risks, and to create value for customers. On the whole, capitalism channels selfishness in a direction that benefits civilization, not counting a few fat cats who have figured out how to game the system. No, the guy was not having a joke at my expense. This was written in all sincerity. I love the Dilbert comics and The Dilbert Principle, so I thought this book would be an entertaining read. The book was initially rather funny, but became rather serious as it progressed. Any sprinkling of humour after the first few pages felt merely facetious rather than truly comical. I also felt a little cheated. Adams claims he’s got mediocre talent in writing, drawing and humour, and that his success was due to his being able to combine his several mediocre skills into a winning combination. I love the Dilbert comics and The Dilbert Principle, so I thought this book would be an entertaining read. The book was initially rather funny, but became rather serious as it progressed. Any sprinkling of humour after the first few pages felt merely facetious rather than truly comical. I also felt a little cheated. Adams claims he’s got mediocre talent in writing, drawing and humour, and that his success was due to his being able to combine his several mediocre skills into a winning combination. But I feel that the humour in his Dilbert comics is first rate and the writing is witty and razor sharp. Throughout the book, he tries to downplay his own talent to make it seem like success is possible for anyone, but it is so obviously not true. Other than his talents, it is clear from his stories that he has a measure of tenacity and optimism that most people probably do not possess. He also makes a big claim that one should not do something one is passionate in, but something one is good in, as being good in it will make it more likely for one to encounter success, and success will make one passionate. Yet, later, he says that one way to figure out what one should be working at is to think about what one was obsessed about as a child, and he explains at length about his childhood passion with drawing! I did find some useful and interesting information in the book though. Some were commonsensical, such as to build in an exercise routine (good health + good diet = good energy level, which is essential for success). But there were other more unique nuggets, such as having a system being more important than having a goal (he makes an interesting case for missing the occasional exercise session at the gym – the system of having an exercise routine is more important than the goal of going every day), and looking for patterns in life to figure out what works. Filled with sound, battle-tested advice! Think of it as a big, wise brother sharing you the best of what he's learned. Giving this three stars for purely subjective reasons. The book is on the whole very good: a mix of memoir and advice from someone who has made it big and wants to share some of the things he learned along the way. Where it fell apart for me was when he started talking diet. Adams jokes that you shouldn't take diet advice from a cartoonist. That should have inoculated me against reacting the way I did, but alas, it didn't. The problem is threefold: dietary success is based on a staggering mix of v Giving this three stars for purely subjective reasons. Where it fell apart for me was when he started talking diet. Adams jokes that you shouldn't take diet advice from a cartoonist. That should have inoculated me against reacting the way I did, but alas, it didn't. The problem is threefold: dietary success is based on a staggering mix of variables; the odds that any given reader will actually be helped by copying what Adams does is staggeringly small; and the odds that Adams' advice will run counter to any given reader's personal experience is staggeringly large. Which is what happened with me. So I ended up skimming and skimming to get past the diet-y stuff. Which left me feeling disappointed -- like I'd only gotten two thirds of a book. Some context first: when I got this book, I had no idea what it was about. I just saw a book from Scott Adams, author of one of my favorite comics (Dilbert) and thought "It might be very interesting to read a book by this guy". It remained on my shelf for a few months and eventually I was bored and started reading it. And I really, really liked it. It's part self-help, part autobiography. Adams tells a couple of personal story and outlines his personal view on life. He invite This book is awesome! * Systems are more important than goals. Chasing after goals is hard and risky. Instead, it is better to set up a system and follow it. * The most important metric is personal energy. One should not optimize for getting stuff done, but for feeling energetic as much as possible. * Diet and fitness are really important. If you have those right, things fall into their places more easily. Even if you take just 2% of this book, it's still worth reading it. It makes some very good points. And it's very enjoyable to read. موضوع اصلی این کتاب اینه که راه رسیدن به موفقیت با ایجاد سیستم خیلی راحت تر و محتمل تر می شه و تعیین هدف های مشخص و دقیق بر خلاف نظر رایج باعث شکست و ناامیدی می شه. وقتی کار خاص یا هدف معینی رو دنبال می کنیم و به دنبال رسیدن اون هستیم تا قبل از رسیدن به اون حس نرسیدن به هدف(شکست) داریم و اگه بهش نرسیم این حس شدیدتر و دائمی می شه. کما اینکه هدف دقیق شاید از کنترل ما خارج باشه و عدم دست یابی به اون حس ناامیدی و ناتوانی رو هم به ما منتقل کنه. که این احساسات و جنبه های منفی توی زمینه های مختلف توی ب موضوع اصلی این کتاب اینه که راه رسیدن به موفقیت با ایجاد سیستم خیلی راحت تر و محتمل تر می شه و تعیین هدف های مشخص و دقیق بر خلاف نظر رایج باعث شکست و ناامیدی می شه. وقتی کار خاص یا هدف معینی رو دنبال می کنیم و به دنبال رسیدن اون هستیم تا قبل از رسیدن به اون حس نرسیدن به هدف(شکست) داریم و اگه بهش نرسیم این حس شدیدتر و دائمی می شه. کما اینکه هدف دقیق شاید از کنترل ما خارج باشه و عدم دست یابی به اون حس ناامیدی و ناتوانی رو هم به ما منتقل کنه. که این احساسات و جنبه های منفی توی زمینه های مختلف توی بلند مدت خسته مون می کنه. اما سیستم یک روند دائمیه که توی بلندمدت شانس ما رو برای رسیدن به شادی بیشتر می کنه. در نتیجه به جای تعیین هدف به سیستم متمرکز بشیم. مثلا اگه بحث تندرستی مطرح بشه، کاهش وزن یک هدفه، اما تغذیه و تحرک کافی یک سیستمه. برای بیشتر زمینه ها توی زندگی می شه سیستم طراحی و دنبال کرد. مثلا دنبال کردن علاقه توی کسب و کار چرنده. باید طرح کسب و کارتون عملی باشه و حاضر باشین زحمت بکشین تا به نتیجه برسین. موفقیت توی هر زمینه باعث می شه تا بیشتر به این موضوع علاقه مند بشین. به جای زمان، بهتره انرژی خودتون رو مدیریت بکنین. برنامه خودتون رو طوری طرح ریزی کنین که کمترین نیاز رو به قوی بودن اراده داشته باشه. چون هر برنامه ای که اجراش نیازمند اراده قوی توی بلند مدت باشه شکست می خوره. برای مدیریت انرژی هم اول رژیم غذایی تون رو کنترل کنین، بعد هم روزانه ورزش کنین. و مهارت های جدید یاد بگیرین. به قول نویسنده هر مهارت جدیدی که یاد بگیرین شانس موفقیت تون رو دو برابر می کنه. مهارت های خودتون رو با هم ترکیب کنین و شروع کنین خلق کردن. یک سری مهارت هایی هستن که قابل انتقال به حوزه های مختلف هستن. اگه این مهارت ها رو یاد بگیرین می تونین خیلی جاها ازشون استفاده کنین: سخنرانی، روانشناسی، نوشتن تجاری، حسابداری، طراحی، گفتگو، غلبه به خجالت، زبان دوم، گرامر صحیح، گلف بازی، متقاعد کردن، تکنولوژی و به کارگیری تکنیک های مناسب برای استفاده از صداتون. خوب بخوابین، مثبت فکر کنین، کاری کنین که برنامه زمانی تون انعطاف پذیر باشه، روی چیزهایی کار کنین که قابل ارتقا باشن، با ایجاد روتین تعداد تصمیم هایی که باید بگیرین رو کم کنین. بگردین الگوها رو توی جنبه های مختلف زندگی پیدا کنین. با این کار از شکست ها جلوگیری می کنین و موفقیت ها رو تکرار می کنین. شانس مهمه. اما می تونین شانس خودتون رو بالا ببرین. آماده باشین. و وقتی فرصتی دیدین تردید نکنین. جمله های تاکیدی برای خودتون ایجاد کنین و با خودتون تکرار کنین. این موضوع رو توی بخش های مختلف در کنار خاطرات خودش از موفقیت ها و شکست ها و مشکلاتی که داشته با زبانی ساده و طنزآمیز بیان کرده. توی نوع خودش خوب بود. از ساده سازی ها و منطق پراگماتیکش خوشم اومد. I enjoyed this book very much. In it Scott Adams, the author of the comic strip Dilbert, tells us how he accomplished a very successful life after years perceiving himself as a failure. First he states that all his failures prepared him for his success. We tend to learn from our failures things that may help us in the future. He also proposed do not set goals instead use a system to accomplish tasks. An example of a system approach was told to him by a CEO of a screw making company. The CEO told I enjoyed this book very much. In it Scott Adams, the author of the comic strip Dilbert, tells us how he accomplished a very successful life after years perceiving himself as a failure. First he states that all his failures prepared him for his success. We tend to learn from our failures things that may help us in the future. He also proposed do not set goals instead use a system to accomplish tasks. An example of a system approach was told to him by a CEO of a screw making company. The CEO told him that when he was young once he got a job, he continued to look for a better one. And finally worked his way up to CEO. Furthermore, he insists that good health is essential to success. He is a vegetarian who eats as much as he wants because it is all fruits and vegetables and as a result never gains weight. He also believes that exercise is essential. These practices will make you look better therefore increasing your chance at jobs and at making new friendships. Some tips he offers is eating cheese because cheese is filling. Exercise at the same time every day. If feeling lazy try drinking a cup of coffee to perk you up so you will exercise. He, in addition, proposes that is better to be good at many things rather than being great at one thing. Additionally, he has tried and had a lot of success using affirmations. He lists in his book everything he eats and the last chapter is a summarization of the entire book. I rate this book very highly for a Self Help book. I wish I could have got hold of this a few years ago. It sure would have saved me some time and energy in acquiring some of the not-so-common sense and self-awareness as an adult. Definitely a book I'd recommend. These are mostly personal opinions of Scott, derived from patterns he's observed, on things that he considers are required to succeed at a practical level. I knowingly nodded my head at most of the book, while some parts did result in a puzzled frown. There are also workable mind hacks t I wish I could have got hold of this a few years ago. It sure would have saved me some time and energy in acquiring some of the not-so-common sense and self-awareness as an adult. Definitely a book I'd recommend. These are mostly personal opinions of Scott, derived from patterns he's observed, on things that he considers are required to succeed at a practical level. I knowingly nodded my head at most of the book, while some parts did result in a puzzled frown. There are also workable mind hacks that might help us do the things that are easy to do, but are also easy not to do. Which should be easy once we realise that we're just programmable moist robots. As a long-term reader of his blog I'm used to his thought processes and simplifying style, and some ideas were familiar. On reading a compressed volume such as this though, I'm struck by how much I've looked forward to his posts and how his writing has nudged me over the past decade or so. "Cognitive dissonance" as a topic, for example, is something that I vividly remember coming across on his blog about 8 years ago, which led me down to the wider world psychology, behavioral economics, McRaney and the rest. Witty, prudent, anecdotal. Could have been shorter/funnier. My biggest takeaway would be the systems vs goal theory. Makes so much sense. Although there's nothing exceptionally groundbreaking in this book, Scott Adams' personal touch, and unique perspective on standard self-help fare renders this book quite enjoyable. Never a big reader of Dilbert, I first became intrigued by Adams' story when he appeared on the Tim Ferriss podcast (great episode). Adams discussed his belief in affirmations and how he'd utilized them at various points in life. That discussion alone was enough for me to put the book on my TBR list, but it wasn't un Although there's nothing exceptionally groundbreaking in this book, Scott Adams' personal touch, and unique perspective on standard self-help fare renders this book quite enjoyable. That discussion alone was enough for me to put the book on my TBR list, but it wasn't until I came across this excellent article discussing 10 takeaways from the book—that I actually started reading it. The portion on affirmations was one of my favorites, but there were many parts that were entertaining, informative, and good reminders. Adams was able to overcome several health issues, and admits part of his success was pure luck, but of course, a plan of attack and mindset play a huge role in life. Systems, skills, energy and proper management can increase the odds of success tenfold. Adams even discussed giving up Diet Coke and becoming a vegetarian/pescatarian, which really struck home for me as I'm on day 13 with no Diet Coke, and a new attempt at vegetarianism. This is probably the best book that I’ve read on how to get my life together. It’s encouraging, motivating, and it helps that the author is entertaining, which one would expect, since he’s the creator of Dilbert. I’m not a Dilbert fan, but that didn’t stop me from loving this book. I really enjoyed his direct and simple writing style. I wish that this book had been published earlier in my life. This book was so good that I plan on re-reading it from time to time. “The This is probably the best book that I’ve read on how to get my life together. It’s encouraging, motivating, and it helps that the author is entertaining, which one would expect, since he’s the creator of Dilbert. I’m not a Dilbert fan, but that didn’t stop me from loving this book. I really enjoyed his direct and simple writing style. I wish that this book had been published earlier in my life. This book was so good that I plan on re-reading it from time to time. Every time somebody asked me what I was reading, I was like "umm.. it's a self-help book." -I love self-help books! What's the name? -It's nothing like its title, don't get me wrong. How to Fail at Almost Everything and Still Win Big. Although this book costed me several awkward social interactions, I don't hold grudge because it was worth it. I'm not the self-help type, but I'm actually growing to like them thanks to this book. It offers vari Every time somebody asked me what I was reading, I was like "umm.. it's a self-help book." Although this book costed me several awkward social interactions, I don't hold grudge because it was worth it. I'm not the self-help type, but I'm actually growing to like them thanks to this book. It offers various contentious advice like goals are for losers and eat whatever you want and stay healthy, but Adams explains them quite well. As the author noted plenty of times in the book, you should be careful to follow advice from a cartoonist, so make sure to take this book with some grain and salt. I personally found lots of useful ideas from here. And yes, about the title. I can say it's a misnomer since we can hardly label one with net-worth of $75 million a failure, can we? "Failure always brings something valuable with it." make sure to learn everything because it goes handy later on, particularly "public speaking, psychology, business writing, accounting, design, conversation, overcoming shyness, second language, golf, proper grammar, persuasion, technology, proper voice technique"
3. Don't talk about boring experiences (TV show, meal, dream, etc.). 4. Don't dominate the conversation. Let others talk. 5. Don't get stuck on a topic. Keep moving. 6. Planning is useful but it isn't a conversation. 7. Keep the sad stories short, especially medical ones. "Anyone who is confident in the face of great complexity is insane." bananas, protein bars, peanuts, mixed nuts, cheese, whole wheat pasta, edamame (soybeans), broccoli, cauliflower, brussels sprouts, fish, lettuce, tomatoes, apples, pears, carrots, radishes, cucumbers, quinoa, brown rice, berries. Let me start by saying I'm a big fan of Dilbert. Having worked in a few bureaucracies, I've read more than one Dilbert strip that has happened to me. That said, this is not a Dilbert book. This is a self-help book. Fortunately, it's a good one. Adams's ability to distill ideas down to their basic elements is what makes this book a solid read. As an author, I agree with his premise that failure is essential to success. If you want to succeed, you have to be willing to fail. I wrote a lot of junk Let me start by saying I'm a big fan of Dilbert. Having worked in a few bureaucracies, I've read more than one Dilbert strip that has happened to me. That said, this is not a Dilbert book. This is a self-help book. Fortunately, it's a good one. Adams's ability to distill ideas down to their basic elements is what makes this book a solid read. As an author, I agree with his premise that failure is essential to success. If you want to succeed, you have to be willing to fail. I wrote a lot of junk before I was able to have my first novel, The Wings of Dragons, published. It's great to see Adams showing people that failure is a good thing and something to learn from rather than fear. Here is a book of life advice that every 18 year old should read. If you're long past 18, you should still read it. He combines a personal story of a major setback with wisdom that can only be acquired through years of failures with a sprinkling of success. Adams will reveal his secrets like using a system instead of goals, building skills necessary to make money in any environment and knowing how to be happy. There are plenty of examples of advice that I wish I had known when I was 18. It was "OK". Most of the insights offered I already knew, but still enjoyed his "take" on them. He always says not to take the advice of cartoonists and check with your doctor before taking any of his medical advice. I don't know why but that always made me chuckle inside. The most interesting part the book was learning of his voice illness and how he overcame that. All-in-all, he has had an interesting and charmed (he says to position yourself for luck to find you) life. Excellent book. The systems approach is very useful. I've read handful amount of books about self-development and time management, but this one is definitely different from everything I've ever read. It is a little bit about everything, with simple explanations, and with some kind of very attractive wisdom. It is about food and energy, goals and systems, mental and physical health, self-criticism and honesty to yourself. I can't remember enjoying the book so much (last time it was a fabulous "Surely you're joking Mr. Feynman). It was fun to read, a I've read handful amount of books about self-development and time management, but this one is definitely different from everything I've ever read. It is a little bit about everything, with simple explanations, and with some kind of very attractive wisdom. It is about food and energy, goals and systems, mental and physical health, self-criticism and honesty to yourself. I can't remember enjoying the book so much (last time it was a fabulous "Surely you're joking Mr. Feynman). It was fun to read, and it provoked so much thoughts, ideas and ... most importantly ... actions. I have never gotten past a chapter or two of a Tony Robbins or Dr. Phil book without quitting even though they have been recommended by smart people that I respect. I just figured it was a genre that doesn't work for me. It was no different than reading Isaac Asmiov and Larry Nevin without becoming a fan of science fiction books. Reading Scott Adams has given me a different perspective. I now think the wisdom from others only works practically if you are reading someone that shares enough of you I have never gotten past a chapter or two of a Tony Robbins or Dr. Phil book without quitting even though they have been recommended by smart people that I respect. I just figured it was a genre that doesn't work for me. It was no different than reading Isaac Asmiov and Larry Nevin without becoming a fan of science fiction books. Reading Scott Adams has given me a different perspective. I now think the wisdom from others only works practically if you are reading someone that shares enough of your worldview. I have never read Adams blog and I don't think I have read more than 3 Dilbert's in my life, but I realize from the memoir that Adams approaches life in ways that are very similar to mine. And he is wise enough to understand that his overall approach to life is why he is successful rather than any one decision. He makes it clear that your journey will be different, but always consider your approach. The book has things that I already understood consciously even if I fail in the implementation. Like Adams I have always been happier and more successful when I am healthy from eating well and exercise. When I focus on exercise everything else seems to fall into place, but it's a lot more difficult now that I have kids. The family tends to take my absences as personal rejection and I have failed at getting them to join along with me. After reading this book I realize that I need to be more creative in my approach and make exercise a family activity. There are other things in the book that I have done intuitively mostly because of my personality that Adams recommends and it really spoke to me. The biggest takeaway is that people should have systems instead of goals. Goals mean you are failing every day because you haven't achieved the goal. Systems build long term success by helping you learn from everything, especially your failures. Systems put you in position to seize opportunities. I understand this personally because I'm not temperamentally goal-oriented. It's an approach that works for a lot of other people including my wife, but not me. I'm just not equipped to say where I want to be in 5 years or 10 years because I have always focused on making the best decision I can at the moment. I have found that making good decisions in the aggregate has made me successful overall. It's also allowed me to pivot when opportunities have risen that I didn't imagine 5 years earlier so I don't struggle with whether it's taking me off the path I have set for myself. I can evaluate it independently without remorse. "You've heard the saying that knowledge is power. but knowledge of psychology is the purest form of that power. Systems vs Goals thinking. A goal is a specific objective that you either achieve or don't sometime in the future. A system is something you do on a regular basis that increases your odds of happiness in the long run. If you do something every day, it's a system. If you're waiting to achieve it someday in the future, it's a goal. If you achieve your goal, you celebrate and feel terrific "You've heard the saying that knowledge is power. but knowledge of psychology is the purest form of that power. Systems vs Goals thinking. A goal is a specific objective that you either achieve or don't sometime in the future. A system is something you do on a regular basis that increases your odds of happiness in the long run. If you do something every day, it's a system. If you're waiting to achieve it someday in the future, it's a goal. If you achieve your goal, you celebrate and feel terrific, but only until you realize you just lost the thing that gave you purpose and direction. Your options are to feel empty and useless, perhaps enjoying the spoils of your success until they bore you, or set new goals and re-enter the cycle of permanent presuccess failure. Goal-oriented people exist in a state of continuous presuccess failure at best, and permanent failure at worst if things never work out. Systems people succeed every time they apply their systems, in the sense that they did what they intended to do. The goals people are fighting the feeling of discouragement at each turn. The systems people are feeling good every time they apply their system. That's a big difference in terms of maintaining your personal energy in the right direction. Willpower: Science has demonstrated that humans have a limited supply of willpower.If you use up your supply to resist one temptation, it limits your ability to resist others. In the long, run any system that depends heavily on willpower will fail. Or worse, some other part of your life will suffer as you focus your limited stockpile of willpower on that one activity. One of the best pieces of advice I've ever heard goes something like this: if you want success, figure out the price, then pay it. I'm pre-emptively giving this the "best book I read in 2015" award. It's witty, but more importantly, chalked full of life tactics and strategy. A significant chunk of the book covers energy-management techniques, with seemingly-solid discussions on diet and exercise aimed towards people who feel completely overwhelmed when they approach the literature in either of those topics (ie. me). I got a huge inspiration boost out of this book, and for the most part couldn't put it down -- except when it I'm pre-emptively giving this the "best book I read in 2015" award. It's witty, but more importantly, chalked full of life tactics and strategy. A significant chunk of the book covers energy-management techniques, with seemingly-solid discussions on diet and exercise aimed towards people who feel completely overwhelmed when they approach the literature in either of those topics (ie. me). I got a huge inspiration boost out of this book, and for the most part couldn't put it down -- except when it inspired me to put it down and go exercise, which is a tricky feat indeed. For a super long title, I was happy to dive into another self-help book. I find them quite funny and was hoping to like this one as well. However, I didn't because after the first chapter I was rather bored. I had to find other ways to entertain myself while at work.. because there was no way I was going to DNF it. Not because I hated it or was bored.. I just wanted to see if it was going to get better. I didn't care that I was listening to the audiobook or not.. I'd rather listen than read beca For a super long title, I was happy to dive into another self-help book. I find them quite funny and was hoping to like this one as well. However, I didn't because after the first chapter I was rather bored. I had to find other ways to entertain myself while at work.. because there was no way I was going to DNF it. Not because I hated it or was bored.. I just wanted to see if it was going to get better. I didn't care that I was listening to the audiobook or not.. I'd rather listen than read because I could be multitasking while listening instead of being bored out of my mind reading. I think it went downhill so fast was due to the fact that Scott hasn't really failed at a lot. Or at all. I don't think he understands failure like most people do in our world today. His failures were stupid because of his college days and then even more stupid once he was already successful in life. I get it, people fail at things ever day.. but don't tell me you failed a whole bunch.. or a lot.. because to me those seem like some small failures no matter how long of a list you have. There are a bunch of people who are homeless. People have failed out of high school or college. People have learned to face failure through a lot more difficult things every day. So yeah, this book kind of frustrated me and bored me at the same time. I know I'm going to fail big throughout life but I also know that I have people who will support me no matter what. I wish this had come out when I was a young pup.There is lots of new tricks for us old dogs however!It provided me with lots of ideas and revelations.I'll let you know how it works out a year from now. I listened on audible and it was a very good listen. One of the better books if this ilk I have read / listed to. A lot of good life information I wish I knew 10-15 years ago. Reaffirms many things I am finally understanding why I do and some good new information as well. In recent years, Ada Librarian Note: There is more than one author in the Goodreads database with this name. See this thread for more information. In recent years, Adams has been hurt with a series of debilitating health problems. Since late 2004, he has suffered from a reemergence of his focal dystonia which has affected his drawing. He can fool his brain by drawing using a graphics tablet. On December 12, 2005, Adams announced on his blog that he also suffers from spasmodic dysphonia, a condition that causes the vocal cords to behave in an abnormal manner. However, on October 24, 2006, he again blogged stating that he had recovered from this condition, although he is unsure if the recovery is permanent. He claims to have developed a method to work around the disorder and has been able to speak normally since. Also, on January 21, 2007, he posted a blog entry detailing his experiences with treatment by Dr. Morton Cooper. “I made a list of skills in which I think every adult should gain a working knowledge. I wouldn't expect you to become a master of any, but mastery isn't necessary. Luck has a good chance of finding you if you become merely good in most of these areas. I'll make a case for each one, but here's the preview list.